toasted pumpkin seeds while I considered the possibilities. 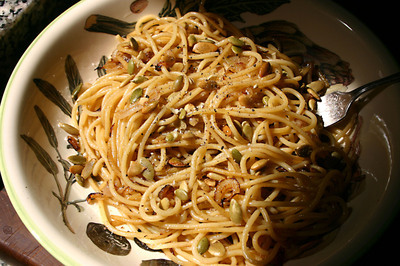 onions are great with orecchiette, so why not spaghetti? are sweetest right before they burn. seeds, tossed it all together, and sat down to lunch. I too let my usually overstocked fridge get dangerously low if it’s close to farmers’ market day. And as for the caramelized onions: they are simply delectable, like your photo. I also love them with polenta or even with a bit of cheese on crostini. It’s amazing the way the heating process draws out their sweetness. I’m still clearing out leftovers from Easter and so supper last night looked lots like this. And when I make fajitas, I cook the onions with brown sugar for a few hours. They’re amazing. Takes 2 onions per person! Yes they really cook down. Great use of leftovers and the pantry. I just came home from the Italian section of Providence with bags of pasta, and my plan is to fridge-scrounge tonight. Thanks for the inspiration! Okay, I need to be able to get you to come around when I’m hungry and I think there’s nothing in my fridge/pantry! Usually I end up going shopping, but I really should be looking more closely at what I *do* have – maybe I’d end up with a quick and tasty meal like this! Brown sugar and onions — sounds decadent Alanna. Your pantry inspires me, Lydia! Truth is, Ellie, I am not usually very good at using up leftovers — guess that’s why I bothered to blog it. I was amazed at how good this was with so little effort. *bet ya haven’t heard that one before. Sometimes the best foods come out of poverty (and I should know!! ), or at least letting the fridge run low. It’s amazing how delicious something with so little ingredients can be. Great blog by the way! Hash brown pizza — sounds like something I’d love, Ronnie! Ed hates onions, Kevin? Lucky for him (and you!) he likes to do the dishes! I bet that was delicious. I love the pumpkin seed addition!